Epilepsy is characterized by spontaneous, unprovoked seizures. For people living with epilepsy, the uncertainty of having a seizure can be difficult to grapple with. For example, having a seizure on top of a flight of stairs can lead to bone fractures and head injuries. Hence, the safety of individuals with frequent and uncontrolled epileptic seizures and the peace of mind of caregivers is something that cannot be taken lightly. It is with this thought that Guardian Helmets was established by Travis Burnett. What makes Guardian Helmets stand out from the rest is their commitment to innovate, design and develop products that reduce the risk of traumatic brain injuries in special needs individuals, and those that may be exposed to such risk at work or at play. A lot goes into designing these helmets -- the company values and uses feedback from patients, parents and experts in the field of traumatic brain injury. The helmets are designed from EVA rubber (also called foam rubber) -- the same material used to make boxing and martial arts equipment. In addition to receiving excellent reviews, the Safety Helmet has also been certified by Brain First - an education and research collaboration created by leading US medical school research centers to improve brain safety and reduce the risk of traumatic brain injury. In addition to epilepsy and seizure disorders, the Guardian Helmets are useful for bleeding disorders like hemophilia and motor disorders such as cerebral palsy. 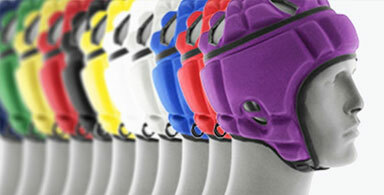 Guardian Helmets come in a variety of customized colors.